About My Mother will make you laugh and cherish your love of American Baseball and feisty mothers. I couldn’t have picked a better book than About My Mother for an escape from the springs rains. 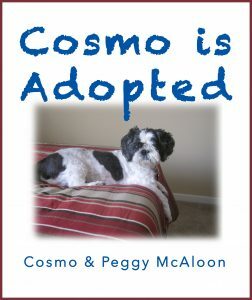 The book was laugh-out-loud funny and the dark hours of a miserable day flew past as I read. I felt like I had returned to my Grandmother’s living room, involved in yet another interaction between my mom and grandma. While Peggy”s mom was a hard Orioles fan, my grandmother was the greatest Cardinals fan the world had ever known. Yes, I could relate to every page in this delightful book. 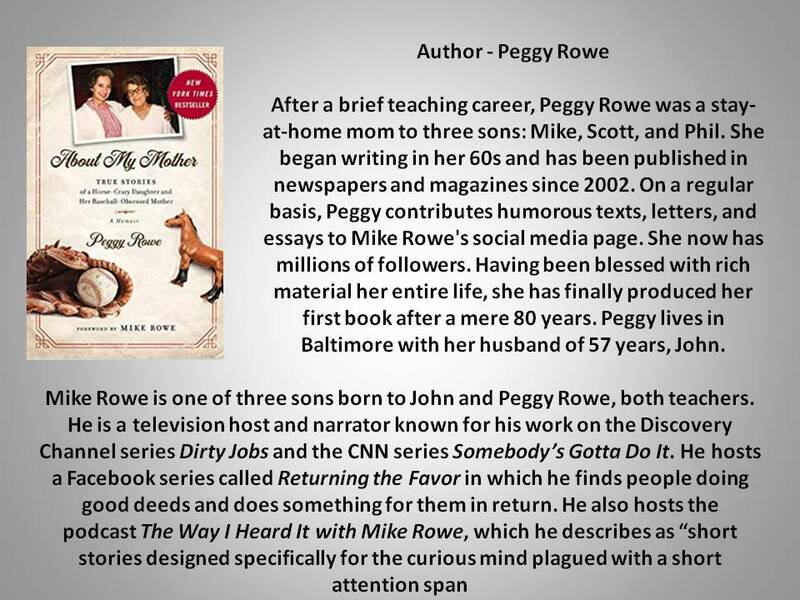 From the time I was a kid, I’ve heard everyone echo the phrase “Father Knows Best.” I grew up in the 50s, and it was well-known that “Mom Ruled the Roost.” Peggy Rowe has written a delightful memoir of the constant struggle mothers and daughters encounter on the journey through life. In Peggy’s words, “Standing in the department store, I felt just as I had as a kid being humiliated by my mom.” Oh, how I can relate to Peggy’s angst through the years as she tried to exist in the shadow of a mom like mine. Women back then were somehow empowered to become bigger than life. The book is an excellent reminder of the beauty of family, the joy of connection, and the women who influenced our lives. Those of us who can relate to Peggy’s memories of growing up with a mother who only wanted the best for her (even though Peggy might not always agree) have seen the best side of life in these United States. One of my all-time favorite TV programs was “Dirty Jobs” with Mike Rowe. I often wondered how he obtained such a warm and pleasant sense of humor…NOW I KNOW! I loved every moment of this book because I grew up in a family filled with laughter, jokes, poking fun at one another AND being a middle child with a tender-hearted Dad and what I then believed to be a monolithic (solid rock on the outside BUT putty on the inside) Mom. I saw this book being “plugged ” on Tucker Carlson’s TV show, the night before its release. So, I immediately ordered it, and I laughed my way through every vignette. In the end, I finally quit reading highlights to my wife and told her had to read it for herself. I loved this book. So many of my memories came flooding back as I read it. I too was horse crazy, had a pretend horse (a sapling stripped of bark with hay bale twine as bridle), loved helping our school librarian before and after school, read every horse book I could find, ran wild in woods and fields, and had a horse friend who ran with me (he on one side of the fence and I on the other). This is just a beautifully written book. In recounting her memories of growing up, Peggy Rowe paints a picture of her mother’s temperament, personality, and world view. The beauty of this memoir is how Ms. Rowe conveys the complexity of her mother’s character through her own experiences. We can see that a child’s view of a parent develops over the years, and is influenced by direct experiences. Peggy didn’t share her 90-year-old mother’s passion for baseball, but when her mom fell and broke her hip, Peggy was grateful for the local team’s support. That support meant everything to her ninety-year-old mom and triggered her mother’s courage to recover after the fall. 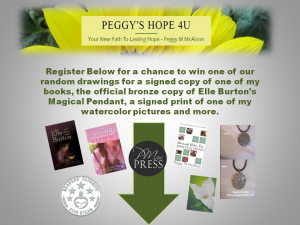 Read the article by Peggy Rowe From Angels on Earth – Posted on Dec 6, 2018. Peggy recounts the obsession with the games in an article in The Baltimore Sun. Everyone in the house knew when the Orioles were playing and the game was on television that the game took priority over everything else. I’m certain she still has stories to share that go far beyond this book.